Today I observed the first green tissue on apples in Gloucester County. The variety was McIntosh and it is usually the first to break bud with Gala not far behind. Using the NEWA Apple Diseases site and plugging in 4/4 as the date for 50% green tip for McIntosh we see that there is about 1% ascospore maturity in Upper Deerfield. While there is inoculum present we are currently at low risk for scab infection even in high inoculum orchards both because there is so little mature ascospores available and so little tissue present. That said, going forward the risk of infection will increase rapidly and infections are possible any time the requirements for an infection period are met. (See table below, Mills’ Apple Scab Infection Table). Copper applied for fire blight control should be sufficient for now, especially where scab was controlled last year. Growers that had scab last year should begin a control program using highly effective materials beginning at green tip. Remember, no fruit scab last year doesn’t mean that there was no scab in the orchard. Many orchards in southern counties had low levels of scab on the leaves that may not have been noticeable unless the orchard was scouted regularly. 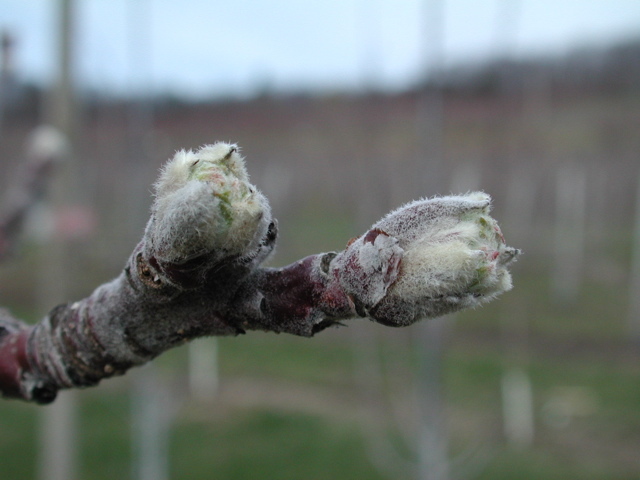 If you are not sure whether or not you had scab last year, treat your orchard as if you did. 33–36 48 72 96 ? 38 37 50 64 ? 39 33 45 60 ? 41 26 37 53 ? Hours of wetness from the beginning of rain (data of W.D. Mills as modified by A.L. Jones). If sporulating lesions are already present, wetting periods required to produce secondary infections are approximately 3 hours less than those listed in the table for primary infection. Number of days required for lesions to appear after infection has been initiated. No further wetting is required. Additional days may be required if conditions are unfavorable for lesion development (prolonged periods above 80 °F or very dry weather).